Are you a mother who has dropped the F-bomb too many times in front of her children? Do you get exasperated with moldy towels, perpetual carpooling, and naughty pets? Have you lost a parent? Have you lost a best friend? 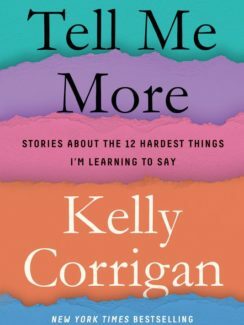 In her newest book, Tell Me More: Stories About the 12 Hardest Things I’m Learning to Say, Kelly Corrigan offers a vulnerable and gutsy examination of the emphatically unglamorous (and often heartbreaking) moments that wrestle so many women to the ground. Whether she’s squabbling with her teenage daughters or cursing the perils of online shopping, Corrigan narrates her episodes with a candor that is addictive. But Corrigan’s volatility isn’t a surprise: since her last book (Glitter and Glue in 2014), she has said goodbye to her father and best friend. These deaths, one foreseeable and the other tragic, serve as the backdrop for Corrigan’s stories. “I’ve seen mortality do its awful ghosting up close—twice—and that has changed the context of everything.” Greenie and Liz are a shadowy presence lingering over every page, offering both comfort and a sense of urgency. Ultimately, they incite Corrigan to want to reconcile what she’s witnessed with how she lives. As Corrigan works through her 12 concepts, she crosses a lot of terrain. She asks big questions, considers her future, and conjures memories—which, if you are anywhere close to her age of 50, you will adore because they are exactly right. Most astonishing: even if you aren’t a middle-aged mom/wife/writer living in California, you’ll still be able to relate to her. She grieves and wears unflattering khakis and sometimes drinks too much tequila—and straightaway reassures us that “we can be damaged and heavy-hearted but still buoyant and insightful, still essential and useful.” I mean, how can you not love someone like this? Like Corrigan herself, Tell Me More is a marvel.